For many years, Southeast Veterinary Neurology operated out of a very small lease space in Miami, Florida. It was so small in fact, that they had to utilize other facilities for their advanced imaging services. Yet they quickly became the leading veterinary neurology facility in south Florida. It was at that point that Dr. Wong decided that a new, larger facility would enable him to provide better service to his clients. But because Miami-Dade is already so developed, Dr. Wong knew needed to find an existing building to remodel into his new facility in order to be centrally located for all of his clients. The solution was the renovation of an existing 6,746 square-foot, former funeral home which now houses five, glass-fronted exam rooms, two neurosurgery suites, and dedicated CT and MRI imaging suites. 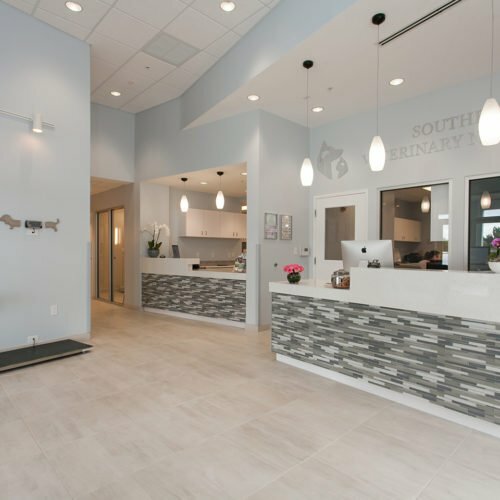 The new hospital has allowed the doctors at Southeast Veterinary Neurology to continue treating dogs and cats with neurological issues all across south Florida and their team has helped over 20,000 pets regain their ability to walk!